Hey guys! I hope you’re enjoying the Spring Festival Blog Hop and all the gorgeous tablescape inspiration from the previous stop on the hop The Crowned Goat! 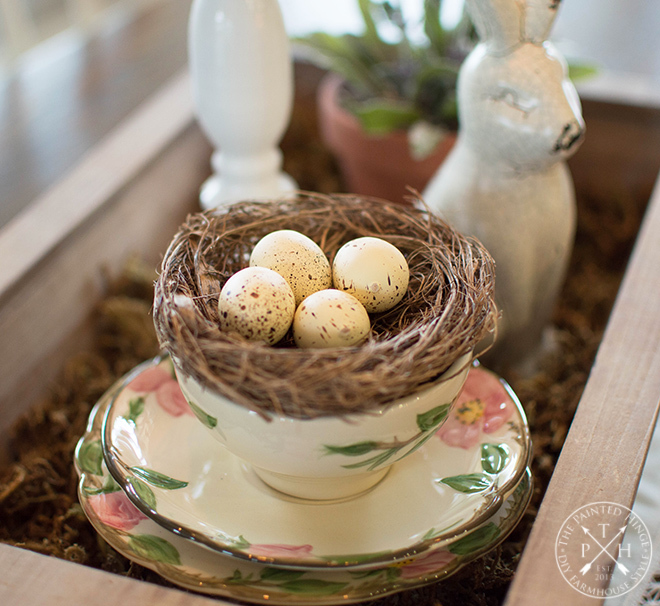 Today I’m sharing a simple farmhouse tablescape ideas for spring, plus a couple of table centerpiece ideas! Since we are in the spring and Easter season, I wanted to use a lot of pastels for my tablescape. 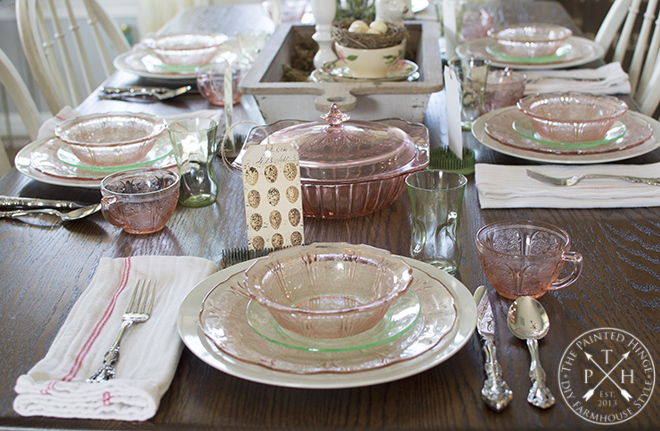 The rose colored pieces are from my grandmother’s depression glass collection. The green colored pieces are uranium glass, which I think are super cool, and not only because it’s pretty – if you hold a black light to them, it will react with the uranium in the glass and cause it to glow! 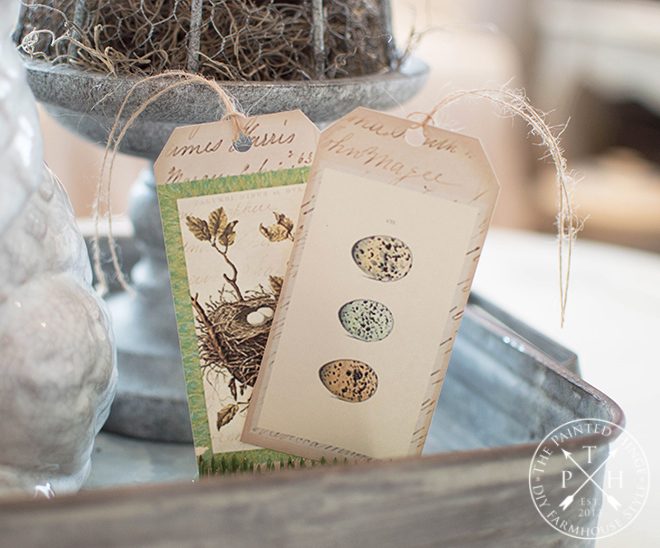 Aren’t these spring themed tags the cutest? They’re free printables from Lilac & Lavender. I printed up several sets of them and mixed them in with my spring decor all over my house! 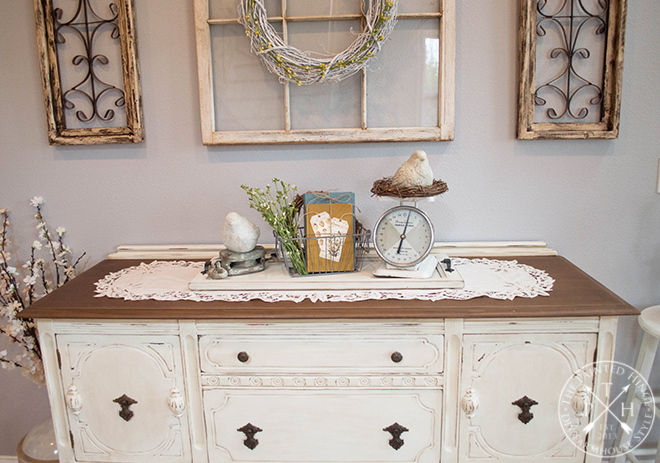 Next up is my sideboard in my entryway. Last up is my coffee table in my living room. 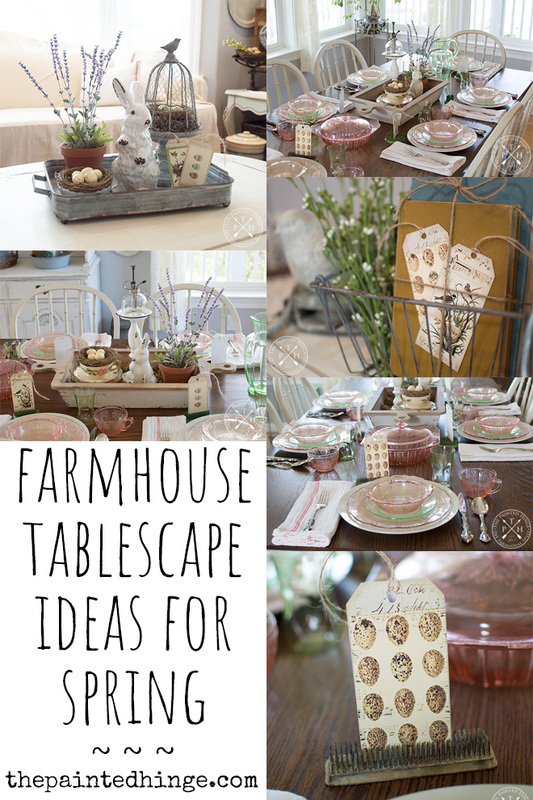 I hope you enjoyed my farmhouse tablescape ideas for spring! 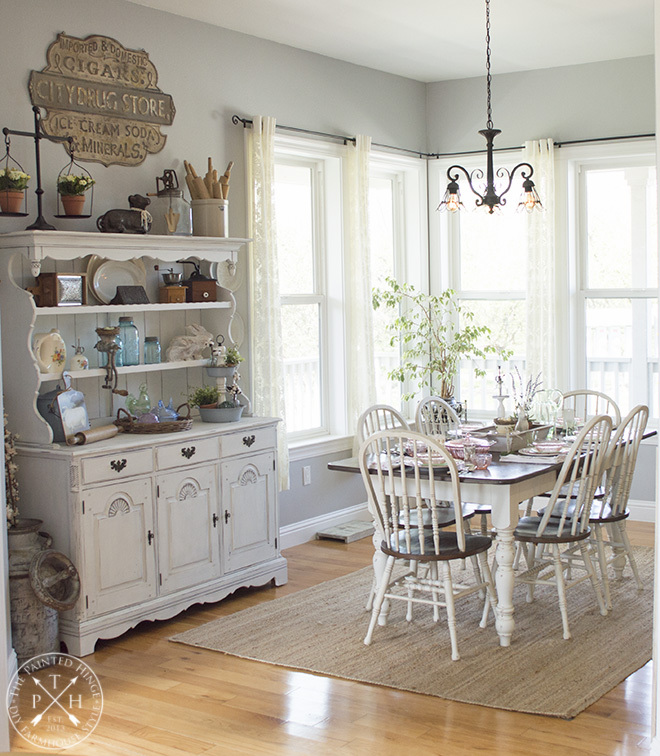 Next up on the home tour is City Girl Meets Farm Boy! 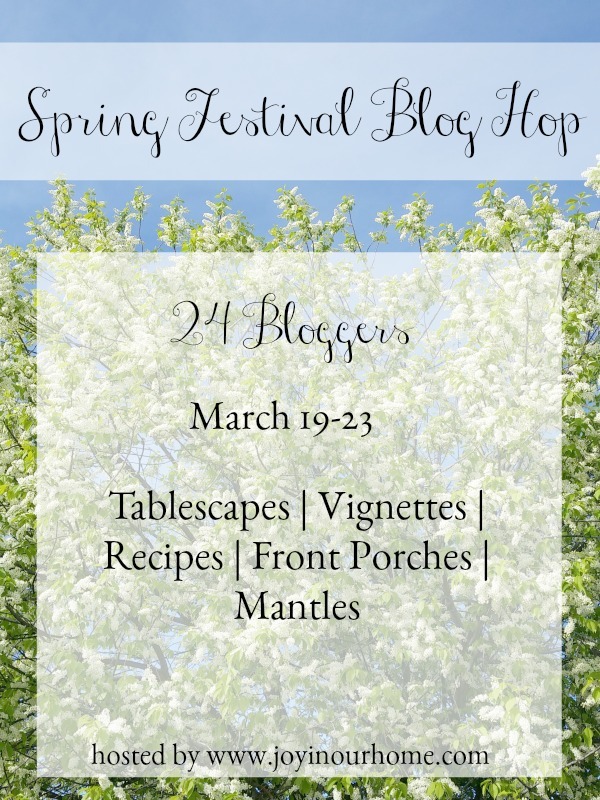 Here’s the entire schedule for the Spring Festival Blog Hop! Thanks so much for stopping by and enjoy the rest of the blog hop! Hi Michelle – your centerpieces are beautiful. And those tags are fabulous! Happy Spring. I love all your tablescape ideas!! They are so cute!! Love both of your tablescapes! 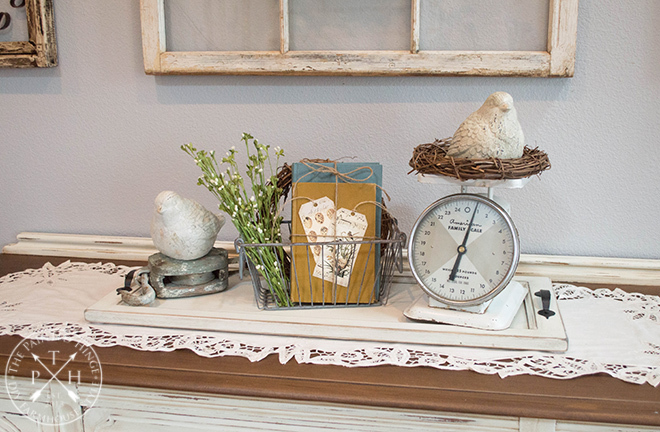 Love the chicken wire cage, the bunny, scale and seed packets! They all look perfect together! I love all your beautiful touches, Michelle. I have floral frogs all around my house holding festive goodies too. Your sweet chippy bunny is adorable. Happy Spring!!! Hugs. 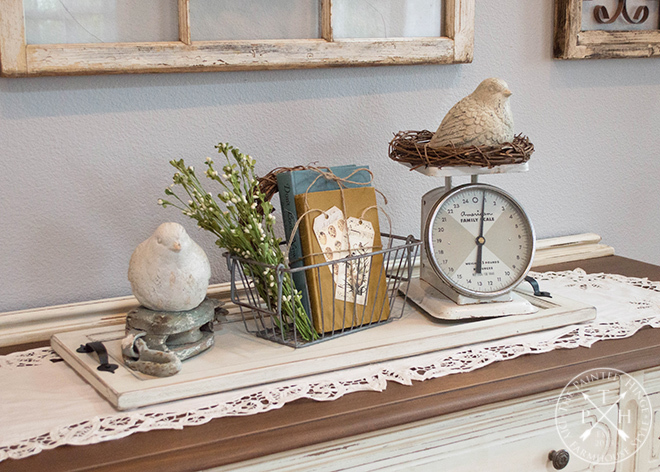 There’s nothing better than a tray to draw your eye in and give more impact to a gathering of items. I love what you’ve done here! 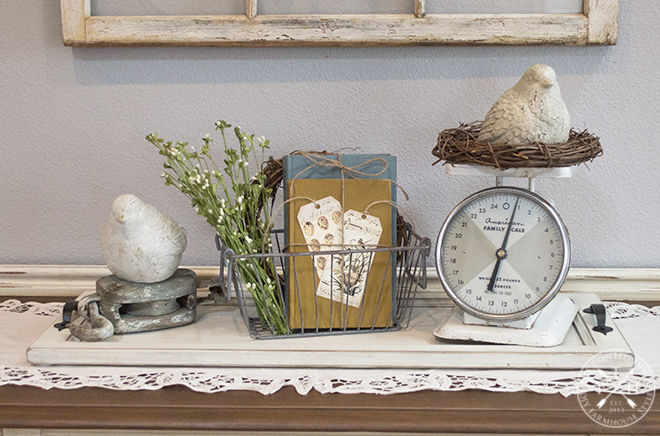 There are so many delightful pieces here – i just love it!!! All are so very pretty! And they all compliment each other so nicely while sill being different! Great job! I love all of the pastel colors and the rose colored pieces are beautiful! 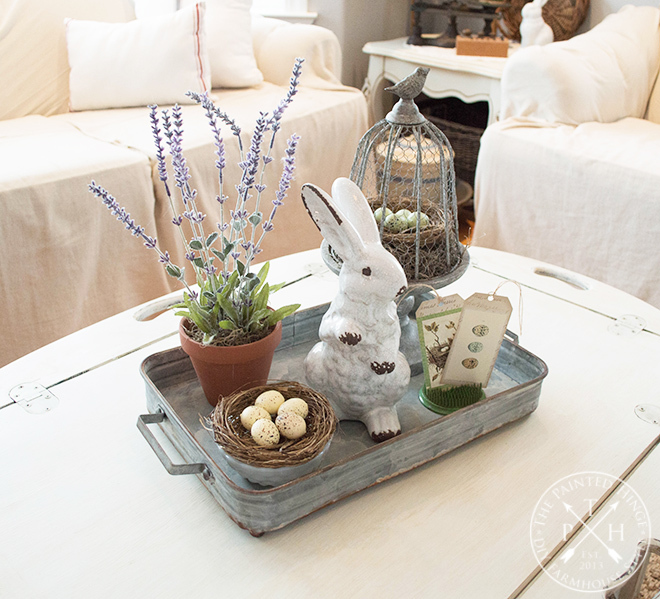 Such a sweet tablescape! Thanks so much Kendra! 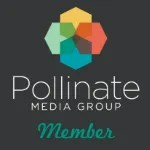 And thanks so much for hosting the blog hop – it’s been super fun! 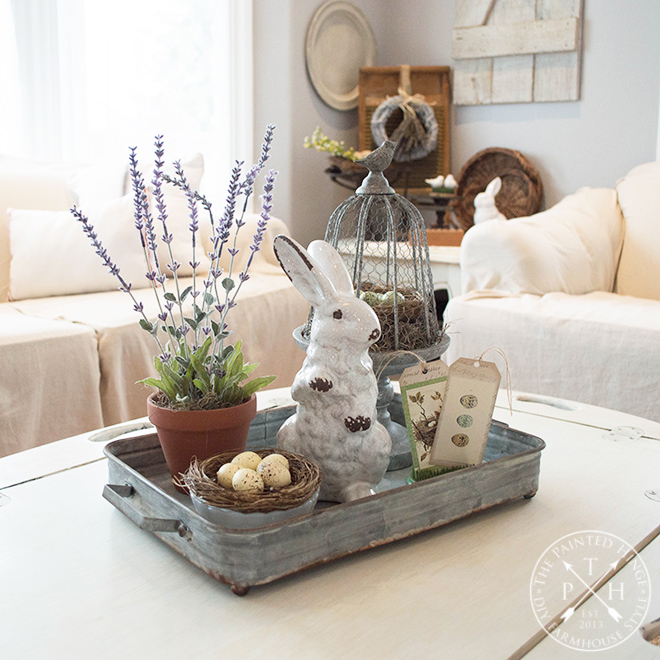 Michelle, I love all your sweet farmhouse touches for spring! You’ve created a beautiful dining room! 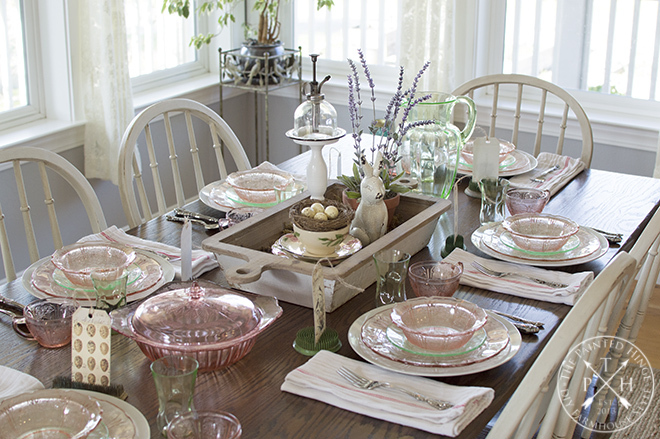 The soft colors of your tablescape are beautiful! And I can never get enough lavender. Michelle, Your table is so beautiful!! I love the depression and uranium glass so much!! So beautiful! That it was your grandmother’s makes it even better! 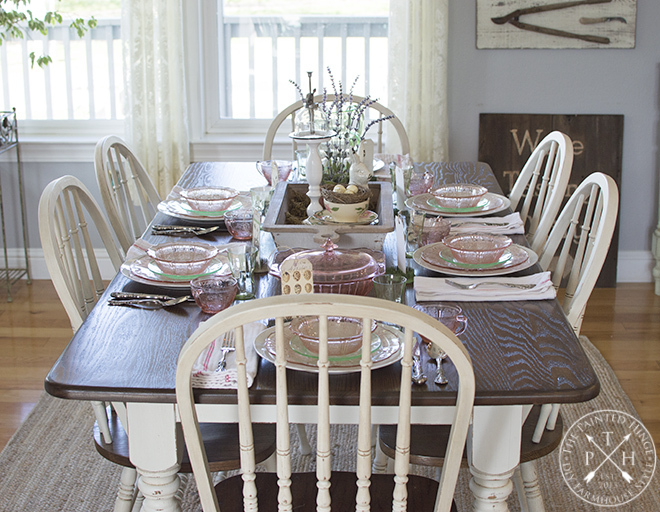 I love the printables and styling you did for the season on all your tables! 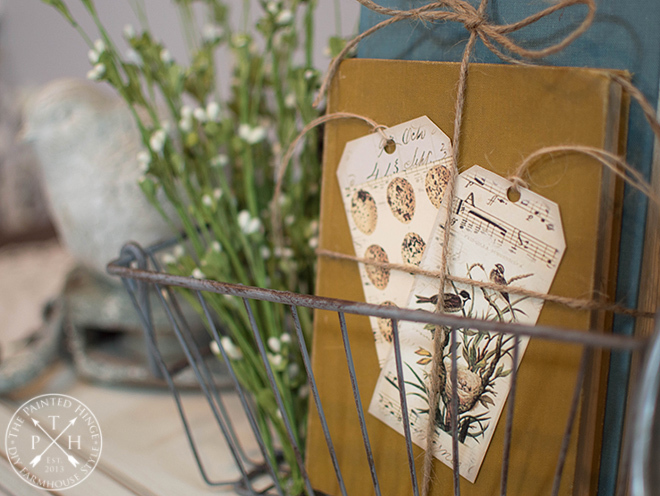 Your spring table is beautiful and I’m loving those tags! This is all so pretty, Michelle! 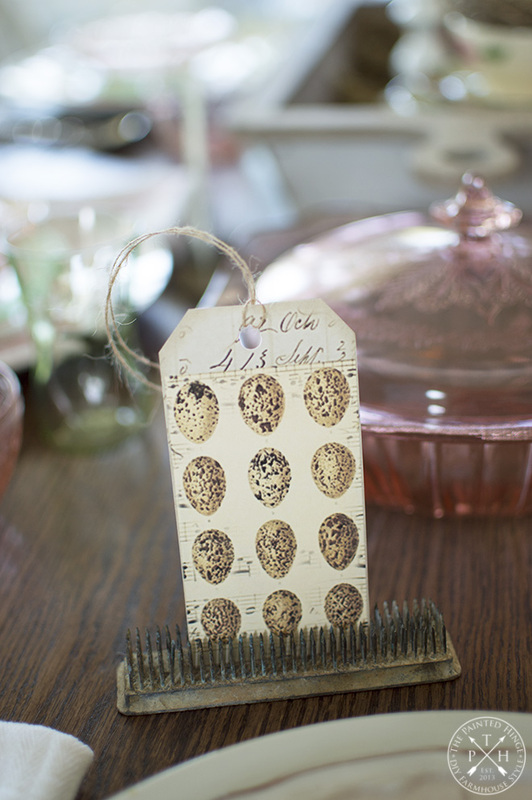 I love those nests and those tags you printed. 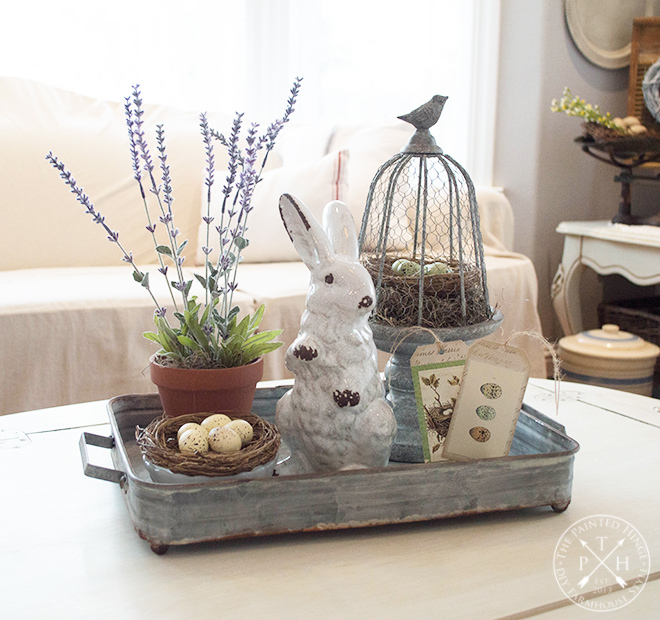 It’s all so perfect for spring and easter. So many good ideas! Unfortunately (or maybe fortunately! 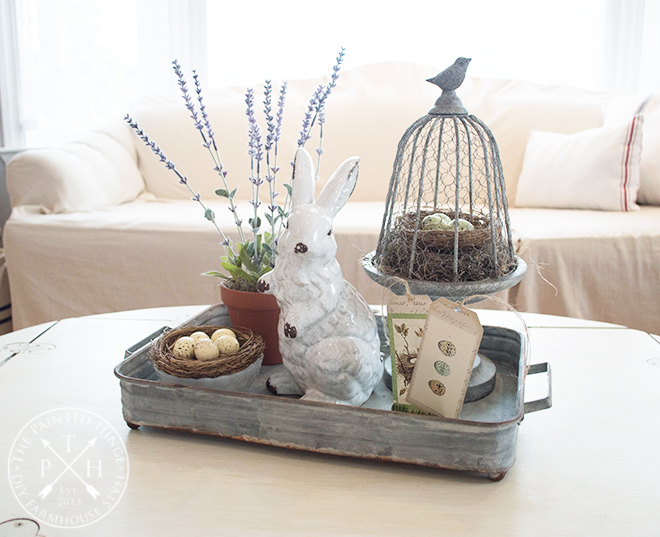 ), my Spring decorating is finished this year, but I pinned it for next year, or maybe even early summer! 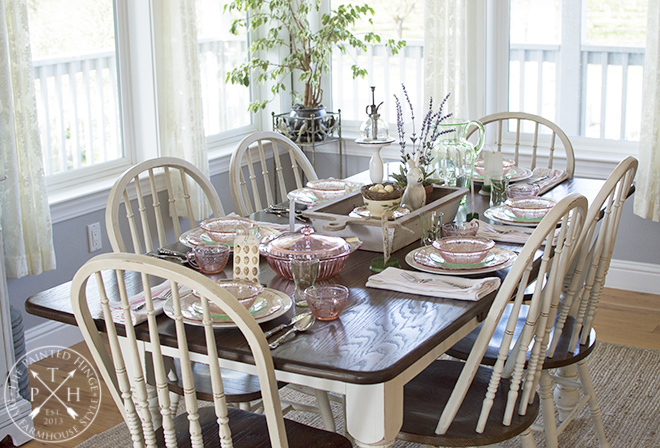 Farmhouse tablescapes are some of my favorites! They look so comfy and remind me of growing up in the country. Yours is so pretty! I love all the little eggs. They aren’t over done and fit in nicely. 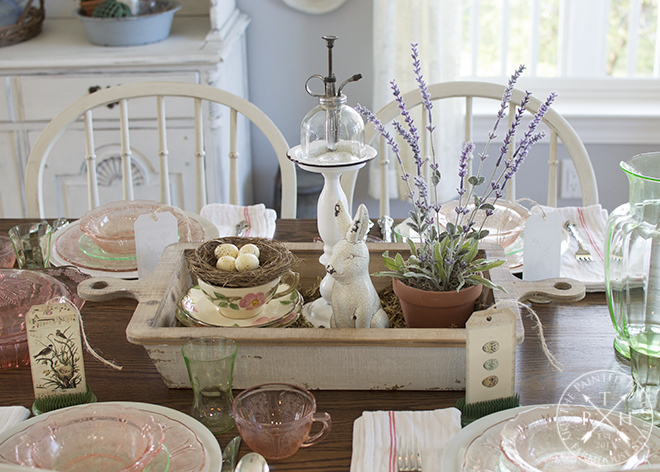 I love all the vintage elements you’ve added to this gorgeous spring tablescape! Great ideas! !